In an upsetting blow to marketers everywhere, research indicates that over 70 percent of marketers failed to deliver quantifiable results for their efforts in 2013. While there’s much to be said for experimentation with new tactics, there’s also a harsh reality here: A huge majority failed to track and attribute marketing spend to closed business. As budgets continue to increase, this tracking is critical to understanding whether your content strategy is effective. Without a means of evaluation (or by ignoring the data you have, which is even worse), you’re letting your gut dictate your content marketing decisions, instead of letting your audiences’ preferences determine your direction. How can we turn this ship around? In short, all marketers need to become agents of ROI. You need to focus on game-changing, rise-above-the-noise tactics that not only deliver creatively, but also lend themselves to better tracking. You need to find ways to collect meaningful insight from your content and become diligent in your analysis of the resulting data. You’re looking to capitalize on trends you see, and course-correct where you can to become more effective and prove real content marketing ROI. 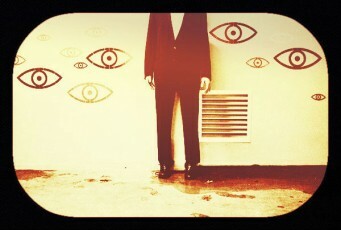 Essentially, you’re content hacking. Luckily, just as online video content is becoming the most expected and popular format, it’s also one of the most measurable content media you can add to your mix. 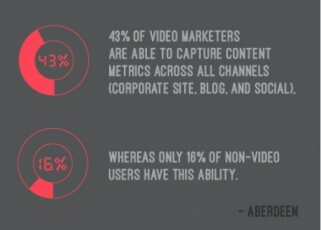 Video content lives in players or containers, so it travels differently than text assets do. When syndicated across the web, you can still access audience engagement metrics from your video players. This isn’t necessarily true with a white paper or other assets, which are typically delivered in a PDF format. You may not know whether the person who downloaded your eBook actually read it (despite giving them a high lead score), but with video content you can see exactly how a viewer engaged. As you can see from the two images above, the second video maintains about 60 percent of the audience right to the end, whereas the first experiences a massive drop off in the first 10 seconds. If I were looking at this visual data in a post-mortem analysis, I’d know that Video 1 was not successful, and I’d want to look into why. Data may not always tell such an exaggerated story, but once you look into something like a steep drop-off at the start of your video, you might discover revealing audience preferences or behaviors. For example, we noticed there was a steep drop off for one of our first home page explainer videos. With a look at the data and some reflection, we realized the audience was probably abandoning the content so quickly because the video was set to autoplay. When someone arrived on our site, they were instantly trying to discover where the noise was coming from in their browser and fumbling to turn autoplay off (maybe for lack of headphones, quiet office areas, etc.). 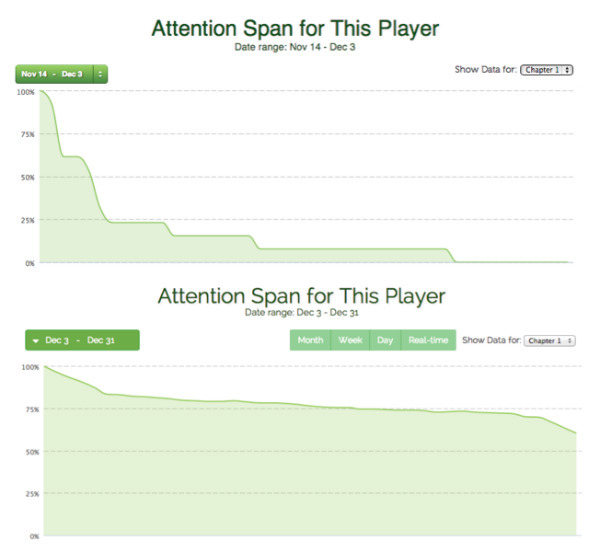 Once we turned off autoplay, the video maintained a strong attention span. This is only one example of the kinds of things you can discover, and this type of data represents your audience’s digital body language. Overall, viewers’ attention span per video can be a great indicator of purchase intent. Discoveries like these will ultimately give you clues as to how your video strategy can be better tailored to your audience’s real preferences — an analysis and evaluation process that will lead to more repeatable success. Tip: A good rule of thumb is to aim to maintain over 60 percent of your audience straight to the end of your videos, where they’ll encounter your call to action. If your video data indicates lower performance, look to make adjustments. 2. Use prospects’ video views to influence lead scoring: Video can also help you become an agent of content marketing ROI in that it contributes to more accurate lead scoring within your marketing automation platform (MAP). You might currently score your leads based on text-asset downloads; however, this doesn’t factor in the video assets individuals have consumed — which means you are missing out on valuable audience data. Consider this example: Two prospects come to your website. Prospect No. 1 hits a few pages and downloads a white paper. Prospect No. 2, however, hits a few pages on your site, watches two overview videos, and then watches a 4-minute product demo and 15 minutes(!) of a recorded webinar. This prospect should get a way higher lead score for the volume of high-value content consumed in a short time frame. Unfortunately, your MAP probably doesn’t track this prospect’s interaction with video as an out-of-the-box feature. If you aren’t pushing video data into individual contact records in your MAP, you’re flying completely blind when it comes to knowing how your videos are influencing your customer’s next steps — extremely revealing data that can indicate their interest or purchase intent. 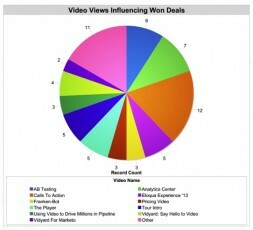 Tip: Start tracking individual prospects’ video viewing history as part of their lead score. This will help you attribute conversions to specific pieces of content and clue you in on any existing content gaps along the funnel. 3. Connect video engagement data to your CRM: Video data can be pushed to a CRM, like Salesforce, just like engagement data can be pushed into your MAP. The data appears directly in a contact’s record, allowing you to see which videos they’ve watched and for how long. Once a viewer hits a certain threshold or percentage of content consumed, you can set triggers (or tasks) in your CRM so, for example, your sales team could be alerted to call a lead and ask them questions related to the context of the videos you know they’ve watched.